They might call them minor planets, but their importance is far from small in astrology. This is one area where size definitely doesn't matter. There are several classes of asteroids. Those we think of first are contained in the Asteroid Belt between Mars and Jupiter and shown in the artist's conception below. It has been theorized over the years that they represent either a planet that failed to form or, conversely, one that was blown to smithereens by a catastrophic collision. To date, neither has been proven satisfactorily, implying they are what they are and should be respected as such. Ceres, Juno, Pallas Athene, and Vesta all reside in this main asteroid belt and were the first to be discovered, beginning with Ceres in 1801. They all mind their own business and largely stay within the bounds of their neighboring planets, who have claimed asteroids as their own from time to time, making them moons. Main belt asteroids are divided into three basic classes, C-type, S-type, and M-type, standing for carbonaceous, silicaceous, and metallic. Another type of asteroid are Near Earth Objects, or NEOs, whose orbit crosses that of the Earth. These have the potential, however remote, to collide with our planet, which would be a very bad day if this were to occur. The Alvarez Theory that states it was just such a catastrophic event that destroyed the dinosaurs has been largely accepted. The resulting crater is believed to exist off the Yucatan Peninsula in the Gulf of Mexico. These asteroids are in turn also divided into three classes, Amor, Apollo, and Atens. These are extremely numerous and won't be covered here as far as their astrological influence. Trojan asteroids share an orbit with a planet. Most, i.e. over 1,800, are co-located within Jupiter's orbit, about sixty degree in front of and behind our largest planet. These, likewise, are not covered here. The Centaurs are classed with comets and other Kuiper Belt Objects. Their orbits are quite eccentric and frequently cross the orbital paths of the planets. Chiron, which is the first Centaur asteroid discovered, orbits between Saturn and Uranus. Their orbits are unstable and easily perturbed by the giant planets amongst whom they roam, but are far enough out not to represent a threat to Earth. 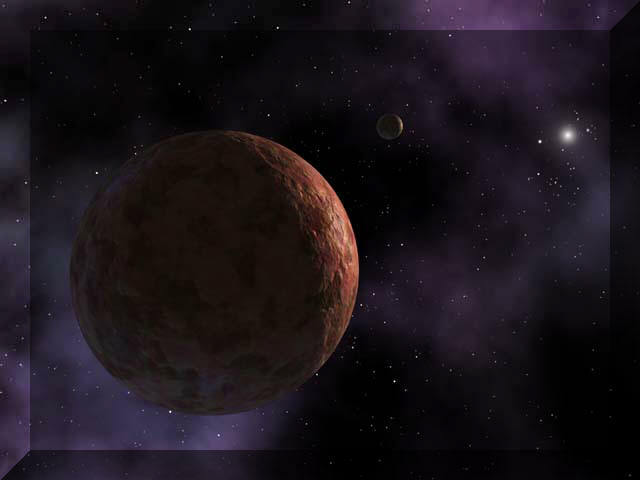 Sedna, an artist's concept of which is show at left, is a transneptunian object between 730 - 1120 miles in diameter, or roughly three quarters the size of Pluto. Like Chiron, she's considered to be beyond the Kuiper Belt, a massive debris field on the fringes of the solar system, and part of the Oort Cloud, which contains billions of icy objects from which most comets originate. Sedna was discovered November 14, 2003 by Michael Brown, Chad Trujillo, and David Rabinowitz. She's unique in that she's the most distant object known to be a part of our solar system. Due to her cold and distant nature, she was named after the Inuit goddess of the sea who's believed to live in the depths of the Arctic ocean. Her red color is believed to be caused by the presence of tholin, a hydrocarbon sludge. Lilith has multiple representations in astrology, which can be quite confusing. Her first namesake is Asteroid 1181, discovered February 11, 1927 in the main asteroid belt by Benjamin Jekhowsky. In addition to this somewhat nondescript asteroid, Dark Moon Lilith is believed by some to be a second, invisible "dark moon" of the Earth that absorbs light instead of reflecting it, thus eluding detection. This stealthy heavenly body was allegedly discovered in 1898 by amateur astronomer, Georg Waltenmath, who claimed to have found references to this Dark Moon that dated back to 1618. While he claimed to have seen it transiting the Sun on February 4, 1898 in the company of 11 other witnesses, other astronomers saw nothing and discredited his supposed discovery. In addition, Black Moon Lilith is a non-physical point in space that represents the second center of the Moon's elliptical orbit. Confused yet? It's kind of amazing that no one could come up with original names for this personality who originates in Hebrew tradition as the first wife of Adam. Asteroids provide another layer of detail to a horoscope beyond that which can be determined solely by planetary Sign and House placement with their aspects. They provide addition resolution to the picture that further defines those archetypes that will be most active in a person's life. Their transits against a person's Natal Chart are equally significant. It's interesting to note that it was right around the time when the sacred feminine was returning to society that these heavenly bodies joined the astrologers pallet for painting a person's picture. Prior to that, the only directly feminine influence was the planet, Venus, even though the Signs were assigned energies of either a male or female nature. Adding the four primary asteroid goddesses, e.g. Ceres, Juno, Pallas Athene, and Vesta, provided a significant new dimension to the feminine elements of a chart for both men and women. Their specific influences are discussed in detail on their respective pages and include such things as mother-daughter relationships; attitudes toward marriage and conventional male-female relationships; feminine leadership and wisdom; and service/devotion, respectively. On a slightly different but related note, if you're fascinated by the fact that the names given to these heavenly objects upon their discovery coincided perfectly with their meaning astrologically in individual's chart, check out "What's in a Name?" Sedna is also a goddess, but she hails from the Arctic Inuit tribe as opposed to classical Greek or Roman mythology. Her story quite tragically addresses issues such as abuse, betrayal, and abandonment, not only in our human interactions, but in our relationship with Mother Earth, as well. Chiron provides an astrological key via it's Sign and House placement as well as natal aspects and transits to the area of our life where we'll receive, deliver and process wounds, primarily of an emotional nature. In keeping with the basic archetype of this "wounded healer," this is often the area from which we take our most painful lessons and through compassion learned first-hand we assist others to navigate the same rough waters. Again, like all other astrological archetypes, it cuts both ways and can also indicate how we hurt others as opposed to helping them heal. Lilith, regardless of which entity you explore, is the dark, mysterious side of a woman that men, especially, fear. She's raw passion, instinct, blindly driven to get what she wants, and undeterred by any obstacle. Mythologically, she's the first wife of Adam, created from the same earth as opposed to his rib, who refused to be subordinate and ultimately left the Garden of Eden in a bit of a rage. After that she became the consort of demons and various other seedy characters. Lilith in the horoscope often concerns relationships which start out with a deep, obsessive passion, but seldom end well. She also indicates how (Sign) and where (House) these energies are expressed in the case of women or, in a man's horoscope, the type of women that will make his hair stand on end, even as he's drawn irresistibly to her despite all logical admonitions to run, not walk, in the opposite direction. Lilith comprises the deep power and energy inherent in a woman's sexuality as well as how she projects her feminine power to get what she wants. How do these astrological entities show up in your life?